Modest Heroes will consist of three shorts by three different directors: "Kanini & Kanino" by Hiromasa Yonebayashi will be a 15-minute fantasy adventure story of two crab siblings, and will be long. "Life Ain't Gonna Lose" by Yoshiyuki Momose will be a 15-minute "human drama" showing the love between a mother and a boy. "Invisible" by Akihiko Yamashita will be a 14-minute "action spectacle" that centers on the lonely struggle of one invisible man. 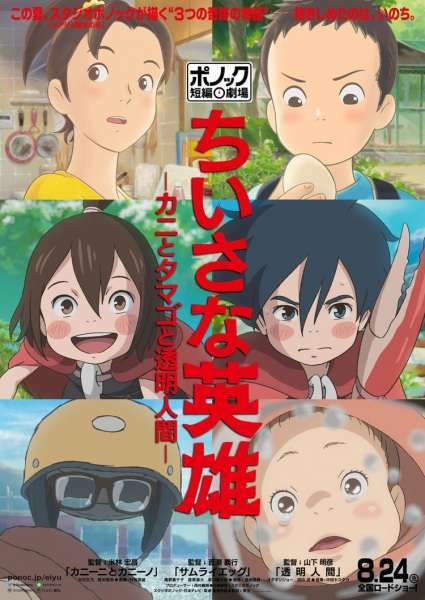 Studio Ponoc describes the shorts as "tales of modest heroes of our times."